A tigress, who routinely updates her facebook and twitter accounts, was captured and released back into the tiger reserve on Friday. 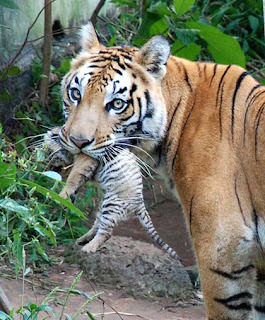 The tigress believed to be four years was nabbed after she tweeted about the living conditions at tiger reserve late on Thursday night,was shifted to the Mysore Zoo for safety and check up and by late evening it was released back into the woods, an official stated, who didn't wished to be named. 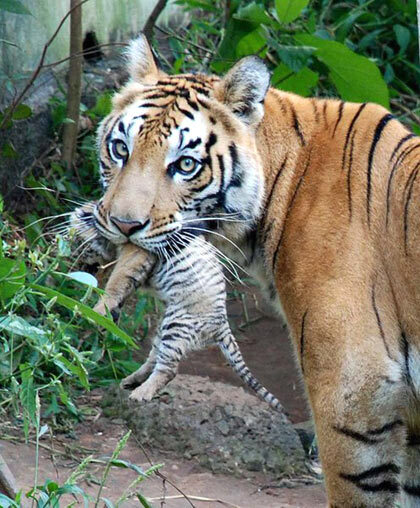 After it was captured, villagers protested complaining, the tigress had terrorized villagers. Mr.Baghbakri, a wildlife activist, said territorial cat fights often lead the tigers to venture outside the forest cover. After her release, because of habit she tweeted "Being a free spirited, I'm bound to do things I love. In the stride of getting people to understand what I want, I went to an extreme of which I am very apologetic. To make mistakes is errr..human and I definitely feel I will make the most of this second chance given to me. Given this chance of going back, I have the enthusiasm of a kid who is getting his old toys back." Irked by the whole incident, where the villagers tried to manhandle when she was nabbed. Rakhi sawant thundered, "There is no police protection at all. The security in-charge was simply smiling and more interested in clicking photos, while the crowd kept touching." "Her eyes are truthful. They mirror rivers, seacoasts, volcanoes, the warmth of moon-bathed promontories. Under her haunches’ golden hide flows an innate, half-abnegated power. Her walk is bounded. Three square yards encompass where she goes. In country like this, I say, the problem is always one of straying too far, not of staying within bounds. There are caves, high rocks, you don’t explore. Yet you know they exist. Her proud, vulnerable head sniffs toward them. It is her country, she knows they exist." Excerpts from the poem "The Lioness", Adrienne Rich, The Dream of a Common Language, 1978.